Wrong! 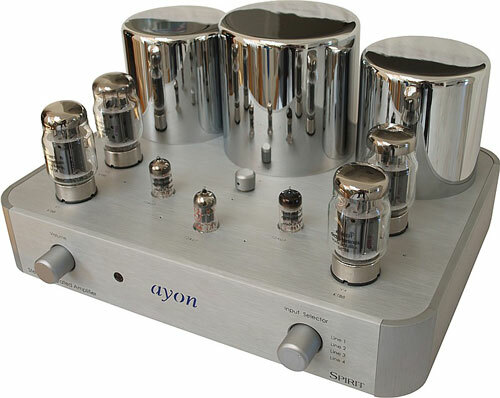 I was chasing another SS player for review, so when Constantine mentioned the Ayon CD-1 tube player, I agreed but was not expecting anything out of the ordinary. There are times in your life when you reluctantly agree to something that turns out to be better than you expected. I want to publicly thank Constantine for calling me and asking if I would review the CD-1. I don’t know if he’s ever heard it, but if he has, he is a generous man to allow me to write the review, because this player oozes luxury and has lovely sound. 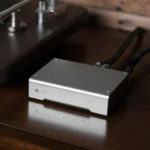 Ayon, a newer name on the North American audiophile scene, is an Austrian concern, headed by owner and chief designer Gerhard Hirt, a young man who finalizes the products he creates using subjective testing. From what I’m hearing of the company’s CD-1 and Spirit, he has a bright future ahead of him! 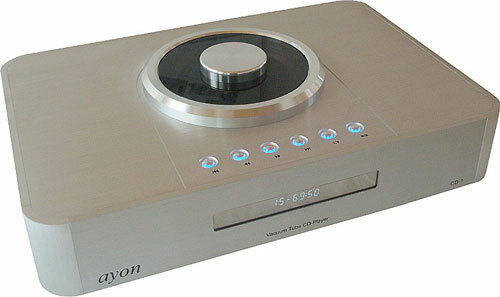 Ayon is distributed in the states by Ayon Audio USA, with Charlie Harrison at the helm. The CD-1 is an example of designing a great sounding component which uses inexpensive military tubes; the 6H30’s to be specific. It struck me that the Monarchy Audio M24 DAC also uses military tubes. From what I have heard of these components, it certainly is no longer the case that one must have esoteric designs and rare tubes to achieve a very palatable sound. There seems to be new life breathed into the mid-price range of tubed equipment, and part of that freshness is due to the superb performance of these affordable military tubes! Unlike the Rega Saturn, another top-loader, the CD-1 does not initialize a disc when inserted. Upon initial startup with a disc inside, the CD-1 enters a warm-up phase for about 1 minute, then initializes. All subsequent discs call for the user to depress the STOP button three times. The first time stops play. The second time the unit displays “Open”, at which time the disc is exchanged. After the new disc is inserted, depressing the STOP button a third time causes the disc to be initialized. Given the fact that the magnetic clamp and acrylic glass cover contain no electronics, the unit needs the command to begin initialization. Since I am used to automatic initialization, there were a few times I waited as the unit sat silently on “Open” until I realized the additional command was necessary. Once I caught on, the sequence became second nature. I did find that the unit would both initialize and play if I merely depressed the PLAY arrow, but Charlie Harrison of Ayon Audio USA advised me that the proper way to do it was by using the STOP function. The CD-1 is a mix of high-end hassle and ease of ergonomics. I found that replacing a disc involved use of both hands, as I did not want to put the smoked Acrylic cover down onto hard surfaces often. I know that the more times such a lid comes into contact with a hard surface, the more that scars will show on it over time. I ended up juggling two discs, the magnetic clamp and the acrylic cover. As long as one does not drop something, the player’s parts are spared any contact and remain pristine. Salvation was found in the top mounted controls, which were blissfully clean and effective. Much more confusing is the remote control. I appreciate the heft of the metal remote, but the monotonous array of identical buttons spaced in a regimented manner and not backlit is overwhelming. It is laudable to have every function at fingertip, but the congestion of the remote makes for having to concentrate every time a function is entered. 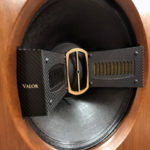 Ayon might want to consider a second, more basic, remote including track selection, start and stop, which would make everyday use much more carefree. Indeed, when I heard what the CD-1 extracts from a disc, I felt more than ever before that people are premature in dumping CD’s for music files. With every month that goes by, I see signs that the inevitable is coming, the lurching to the end of D.A. (Disc Age) and the continuance of the E.D. (Era of Download). But, when I hear a player beautifully sketch what can be heard from a media collection I have been through several times, my heart skips a beat thinking, “People are abandoning this technology and they have no clue how good it can get!” Indeed, I also had no clue. 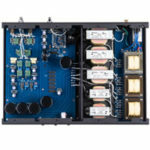 The Spirit integrated amp is yet another delicious offering from Ayon. With similar chassis construction, it is a perfect complement to the CD-1. I was not initially going to review the Spirit, but I had mentioned to Charlie that I was returning an integrated to a manufacturer and would be looking for a new one. He suggested the Spark, a 22Wpc offering, but I felt it might be a bit thin for working with magnetic planar speakers, such as my Eminent Technology LFT-8B, so the Spirit at 50Wpc was settled upon. As in the CD-1, high quality construction is apparent throughout. It is a single-ended class-A triode, negative zero-feedback design with selectable TRIODE or PENTODE mode. Output in Pentode is 50Wpc, and 30Wpc in Triode, and it has four pairs of single-ended inputs. Its tube complement consists of four KT-88 and three 12AU7. 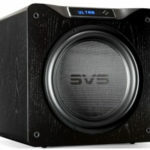 It is designed for more difficult speaker loads, which offers load impedance of either 4 or 8 Ohms at the speaker posts. It has a power supply which is said to, “…provide high speed energy delivery on transients.” It incorporates a timer warm-up circuit for the tubes, has an external STATIC BIAS adjustment on the back for each of the KT-88’s, and like its sibling, is hand assembled. The KT-88’s have a reputation for beautiful sound, and this unit does nothing but reinforce that reputation! The front of the Spirit is elegant in its charcoal black and stainless steel appearance. The rotund transformer towers glisten in sharp contrast to the more austere, 10mm brushed aluminum anodized casing. The front panel is super clean, with volume control and input selector, aside from the red glowing “Ayon” logo, which doubles as the infra-red sensor. The unit can be switched to Pentode mode via a selector located smack in the center of the tubes topside. Equally as clean is the hefty, aluminum remote with MUTE and LEVEL controls (This would be an ideal remote to configure for the CD-1 as well! ).